All materials provided. Bring an apron. Looking at a variety of artists and their techniques, we will create a series of drawings utilising these techniques and exploring composition and interpretation, to broaden our approach and understanding of what drawing can be. This class is suitable for those with some drawing experience. This month we explore the velvety blacks and beautiful tonal qualities of charcoal. As a drawing medium it facilitates freedom of expression with its ability to cover large areas of paper quickly and broadly. Flexible as a medium, its shifting nature, allows for easy corrections and manipulation. We make a series of drawings using nature as our subject matter. We work with a range of toned papers and prepare surfaces that exploit the textural and expressive qualities unique to this medium (gesso, brown paper, tone, large, small). Colour can be exciting and invigorating to use and to experience but as artists it can be a confusing subject to control and understand. In this workshop Brenda Tye will be introduce you to colour theory by isolating colour from the creative experience into a practical exercise. By painting your own complex colour wheel, you will learn how to mix colour, adjust colour values, see colour relationships and control colour. You will experience the subtleties of seeing colour in all its complexity, and begin to understand how it operates on a practical level, so that you can use it in any medium with confidence. In this workshop, you will make bold and colourful studies in watercolour using a variety of methods and approaches. You will complete a series of simple exercises to warm up and get to know the medium, and then begin work on a more detailed study applying techniques learned. You will enjoy discovering the beautiful transparent qualities of watercolour. In this workshop we will use the monoprints of Degas as inspiration to explore this seductive and flexible technique. A unique painterly form of printmaking, the monoprint technique can produce effects that are capable of great subtlety and boldness, from deep tones and rich blacks to the palest of smudges. You will learn how to make a trace monoprint without a press and go onto making a series of black and white prints using both subtractive and additive approaches. Using this technique, you can produce one off unique state prints that lend themselves to exploring a series or theme in depth. We will be printing with an etching press using black printing ink onto a range of papers, painting with brushes and rags and exploring the use of textures with stencils. Dry point etchings allow for unique linear qualities, and the printed marks have a feel and look to them, found in no other medium. The scratchy build up of marks enhance texture and add an unexpected element to your drawings. 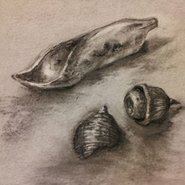 Working from still life subjects you will explore experimental drawing techniques that expand your creativity and approach to drawing. We then choose the ‘best’ ones to translate into drypoint etchings using a printing press to exploit the potential for working in a series capturing a unique response that will expand how you approach your subject. This month we will study the work of Grace Cossington-Smith, exploring her unique sense of colour and mark making. A skilled colourist, Cossington-Smith’s chief interest was colour, and the interplay between colour form and light. Brenda will demonstrate colour mixing and brush techniques using acrylic paint. Experimenting with Cossington-Smith’s techniques, you will compose your own painting. Matisse was inspired by pattern and colour in his painting practice. We look at some of his paintings for inspiration and subject matter. Working from still life and inspired by inventive mark making and creative compositions, we layer translucent washes, and work with a combination of different drawing tools to achieve colourful and dynamic responses to our still life subject. Looking at prints made by Picasso, particularly, the reduction method, often referred to as the “Suicide Method”, you will make a reductive colour lino print. A reduction print is when the final print develops all colours from the same block, cutting away with each colour. After you have designed your image, Brenda will show you the process, and you will create a unique set of coloured prints. Painting in watercolour can be difficult to master. It’s fluid nature can be hard to control and often unpredictable. Learning to work with and exploit the behavior of watercolour is a rewarding challenge. Brenda will guide you through a series of exercises to help you achieve the luminous transparent qualities watercolour is known for. This workshop is a great opportunity to really experiment, explore and make happy accidents with colour.